I was born and raised on the island of Jersey, the largest of the Channel Islands which are closer to France than the UK mainland. As a young school boy my passion for birds and bird nesting migrated into falconry when I obtained a Kestrel eyas from one of the many sea cliff eyries. 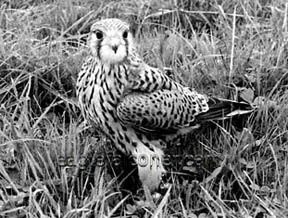 I soon located other falconers on mainland Britain and joined the then largest club, The Hawking Club of Great Britain and also the Welsh Hawking Club. Through the club officials and members of these two clubs I learnt a lot about real falconry. 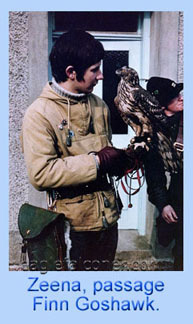 I attended the Second International Falconry hunting meeting of the OFO, the Austrian Falconry Order held in Marchegg, Lower Austria in 1968. By now I was flying a passage goshawk trapped by fellow falconers in Germany. 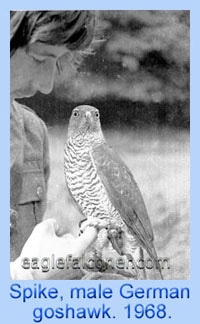 I later flew a large female passage goshawk trapped in Finland in early 1969. Later that year I was offered and accepted an adult male Golden Eagle. The relationship that developed with this eagle directed the course of the rest of my life to date. 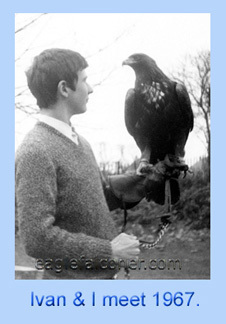 In 1973 I was granted the first licence from the Scottish Home Office to tak e a female Golden eaglet from a wild eyrie for the purpose of falconry and aviculture. Twenty five years later she produced a male eaglet with the help of voluntary artificial insemination. 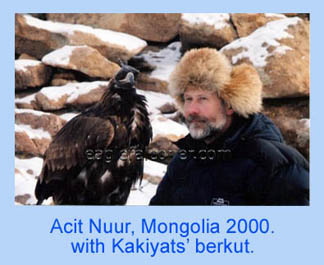 In the year 2000 I travelled to Western Mongolia to live and hunt with the Mongolian Kazakh nomadic eaglehunter families. I have since returned a number of times as well as hunting with families in Kyrgyzstan and China. Check out my articles page to read about some of my adventures with hawks and eagles, and if you like some of the images, the prints page has a wonderful selection of falconry art from Russian artist Vadim Gorbatov. 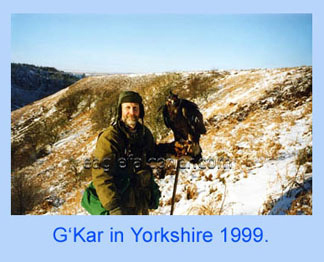 The equipment page shows a few falconry items of interest which are for sale.